They’re very different books, but they have one thing in common: They were named last fall to the National Book Award shortlist, which featured 20 finalists in four categories. 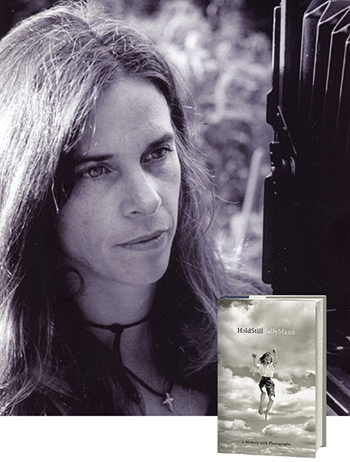 Hold Still, a memoir by Sally Mann ’74, M.A. ’75 was shortlisted in the nonfiction category. The New York Times called the book “uncommonly beautiful,” and The Atlantic described the bestseller as “gorgeously written and convincing.” Mann’s other books include Second Sight, At Twelve, Immediate Family, Still Time, What Remains, Deep South, Proud Flesh, and The Flesh and the Spirit. 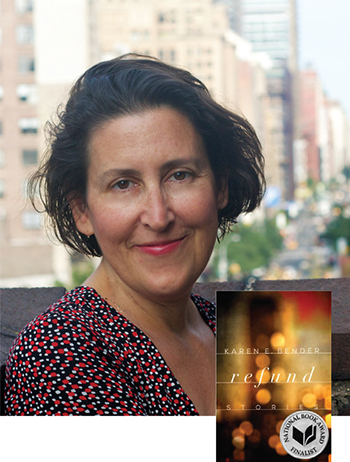 Karen E. Bender, who joined the Hollins faculty in September 2015 as the distinguished visiting professor of creative writing, was a finalist in the fiction category for her short-story collection, Refund. 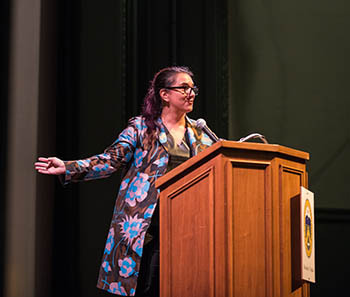 She is the author of the novels Like Normal People and A Town of Empty Rooms, and her fiction has appeared in The New Yorker and other magazines. She has previously won two Pushcart Prizes. 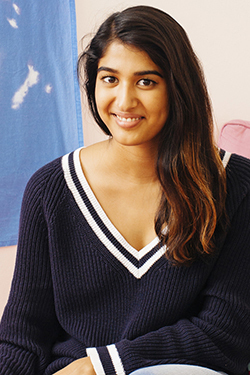 Pavithra Suresh ’16 was one of only 10 students nationwide to receive a Saudi Arabia Exchange Fellowship/Malone Fellowship by the National Council on U.S.-Arab Relations (NCUSAR), a nonprofit, nongovernmental, educational organization dedicated to improving American understanding of the Arab world. Professor of Political Science Ed Lynch, who recommended Suresh for the fellowship, called her “a great representative of Hollins University.” A double major in international studies and communication studies, Suresh is from Raleigh, North Carolina. Applicants had to have participated in Model Arab League, NCUSAR’s flagship student leadership development program, similar to Model United Nations. Suresh was a member of the Hollins delegation that took part in the Southeast Regional Model Arab League at Converse College in March 2015. She and teammate Emily Garcia ’18 were named “best delegation” for their work on the Palestinian Affairs Council. She also took part in the Appalachia Regional Model Arab League, which Lynch organized on campus last November. Read more about Suresh’s experiences during the Appalachia Regional Model Arab League on her blog at www.hollins.edu/studentblogs. It’s becoming one of Hollins’ new traditions: the annual Career Connection Conference, or C3. Held each October for the past three years, C3 brings students and alumnae together for an afternoon of panel discussions, mock interviews, and networking opportunities, including “speed connection” sessions during which alumnae experts meet with one or two students at a time. Some 70 alumnae returned to campus for last October’s C3 event and shared their expertise in the sciences, writing and publishing, entrepreneurship, financial services, education, law, visual and performing arts, and public service. Lublin’s approach to business, teens, and technology has transcended the not-for-profit world. Under her leadership, DoSomething.org became one of the largest youth organizations in America, leveraging Facebook, texting, and Twitter to engage more than 3.6 million teens in its campaigns. 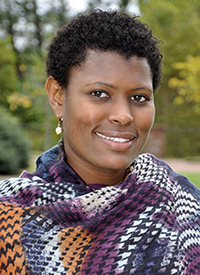 Cortney Phillips Meriwether ’09 was one of the alumnae who participated in the most recent C3. Read the essay she wrote about her experience. 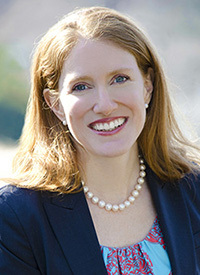 Elected to the Board of Trustees in 2015 were Jenny Van Leeuwen Harrington ’97, Norwalk, Connecticut; Leslie Dunne Ketner ’84, Greensboro, North Carolina; Patricia “Trisha” Peace Rawls ’74, Norfolk, Virginia; and Savon Shelton Sampson ’04, Glen Allen, Virginia. 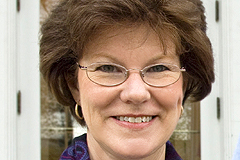 Evelyn Julia “Judy” Lambeth ’73, Winston-Salem, North Carolina, has served on the board since 2010. She was elected chair in 2015. Harrington, who earned an M.B.A. from Columbia University, is CEO of Gilman Hill Asset Management. Ketner has worked for 30 years in marketing and publishing, most recently at Pace, where she serves as vice president and executive director. 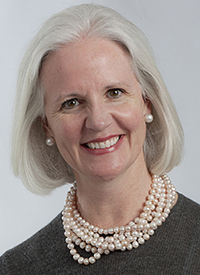 Rawls, who has served for 25 years in numerous leadership positions for nonprofit organizations in the Hampton Roads, Virginia, area, is the current president of the Alumnae Association. 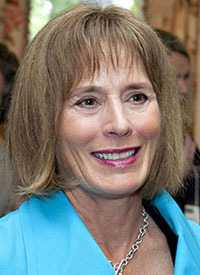 Sampson served on the Alumnae Board for two years before being elected to the Board of Trustees. She is senior marketing manager for McKesson Medical-Surgical. Lambeth received a J.D. 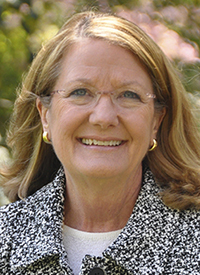 from Wake Forest University School of Law and served as in-house counsel to three Fortune 500 companies—DuPont, ConocoPhillips, and Reynolds American—before her retirement in 2010. The Washington Monthly’s 2015 College Guide and Rankings ranked Hollins among the top 100 liberal arts colleges in the nation (#98)—and one of only four Virginia colleges to earn a spot in the top 100, joining Emory & Henry College (#36), Washington and Lee University (#56), and the University of Richmond (#79). 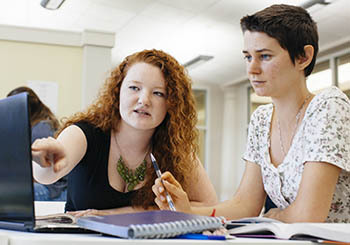 August Roth ’19 (right) works with quantitative reasoning tutor Tegan Harcourt ’17 in the new R. Lowell Wine Center for Learning Excellence, located in the Wyndham Robertson Library. The center, directed by Brent Stevens (writing) and Erin Levering (quantitative reasoning), opened last September. 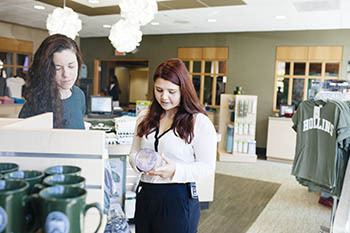 First-year students Gaelin McLeod and Samantha “Sami” Makseyn in the new Hollins Store, which was relocated from the lower level of Moody to the main level last fall.